Mackerel scad (Decapterus macarellus) larvae were raised from wild-spawned eggs at 77-79F on wild copepods and artemia. First record of Mackerel scad culture. 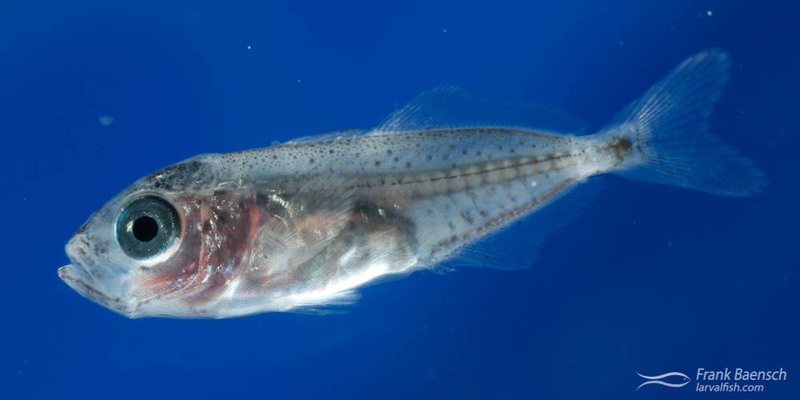 The Decapterus, commonly known as mackerel scads, is a genus of the Carangidae made up of 12 recognized species. Mackerel scads are schooling, coastal pelagic, slender bodied fishes that feed on zooplankton and are typically preyed on by larger fishes. They are important to commercial fisheries but are not aquacultured. Several species have been cultured for research. Four Decapterus species inhabit Hawaiian waters. Mackerel Scad (Decapterus macarellus) in Hawaii. The Mackerel Scad (Decapterus macarellus) is a popular food and baitfish that grows to about 12 inches. It is the most common mackerel scad species in Hawaii waters. Mackerel scads are locally known as opelu. D. macarellus was reared many times from 2012 to 2014 from wild eggs. The eggs were collected from December through September and found to be most abundant in the winter and spring. D. macarellus eggs are covered with bright white pigment spots; contain a single, clear oil globule; and measure about 0.8 mm in diameter. The newly hatched larvae measure about 2.2 mm TL; lack developed eyes, a mouth, and fins; and have a distinct bright white pigment pattern across the mid-body. After one day the pigment moves out into the edge of the fin-folds. Mackerel Scad (Decapterus macarellus) larvae reared in the laboratory. D. macarellus larvae grow quickly and are voracious hunters. They have a large mouth and can prey on larger copepod nauplii (70-80 um) at first feeding (3 dph, 3.7 mm TL). By 7 dph, the pigment on the fin-fold disappears and the gut begins to coil. By 10 dph (6 mm TL), the larvae start to undergo flexion and develop dark pigment on the brain, the tail and along the upper abdomen. At this stage they already prey on adult Parvocalanus copepods. Flexion is complete by about 14 dph (8 mm TL). Schooling behavior along the tank sides is observed a few days later. Weak head spination appears to be the only specialization for pelagic life of the larvae. The larval stage is complete at 23-25 dph (about 15 mm) when the body acquires a silvery appearance. The pelagic juveniles were grown to 40-50 dph (35-43 mm) on newly hatched artemia nauplii and then released into the ocean. D. macarellus eggs are easy to rear to the juvenile stage and have no obvious culture bottlenecks. These fish seem to have good culture potential based on the rearing characteristics of the larvae.